While we have plenty of places to turn for fashion inspiration, Pinterest is still one of the big ones. We stumbled across these Adidas sneakers, the brand's ZX Flux W Core style, and immediately noticed something incredible: they have been pinned almost 100,000 times—94,000, to be exact. And is it any surprise? The world has been going loco over these rose gold sneaks from Nike already, so there's clearly a trend in the air. 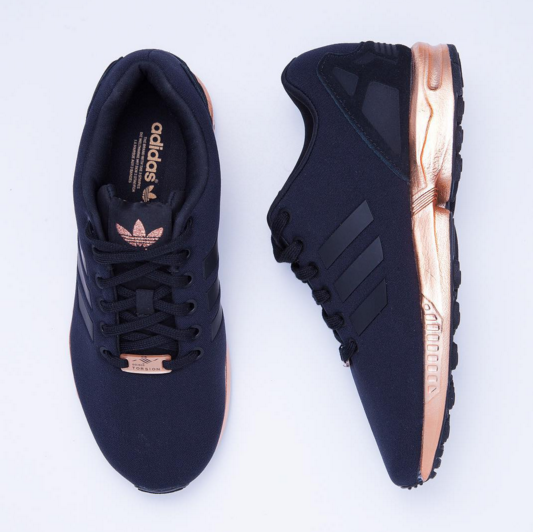 The trainers, in black with a dope copper trim, are eye-catching without being too flashy. When you want to experiment with interesting elements like contrasting metallics, it's best to do so in smaller doses, and these shoes precisely embody that idea. And apparently we're in good company thinking so. While the limited edition style has been around for a while and is only available to shop on resale sites for around the £150 to £200 mark. Well, we did syay they're limited edition… In the meantime, check out the latest kicks on Net-a-Porter to ease the pain, then be sure to follow us on Pinterest for more shoe inspiration.